Our priority is to bring the benefits of Scouting to more youth while remaining true to our mission! The BSA’s mission is to prepare young people to make ethical and moral choices over their lifetimes by instilling in them the values of the Scout Oath and Scout Law. We are excited that our Cub Scouting program is now open to boys and girls! The Alamo Area Council currently serves over 553 girls in the Cub Scout program out of the 61,483 girls served Nationally by BSA in 10,549 Packs. 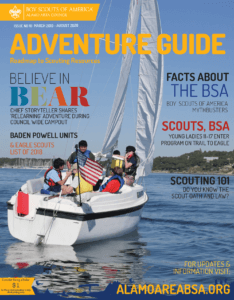 Using the same curriculum as the current Boy Scouts program, the organization is also scheduled to launch Scouts BSA in February 2019, which will serve boy troops and girl troops, enabling all eligible youth to earn the Eagle Scout rank (Scouts BSA troops will be single gender – all girl or all boy). This unique approach allows the organization to maintain the integrity of the single-gender model while also meeting the needs of today’s families. Attached and below are some resource reminders to help us welcome in Scouts BSA! “Be proud of the work we do in service to youth and community! The Boy Scouts of America, Alamo Area Council is THE premier leadership development program for boys and girls wanting an outdoor adventure!” said Angel Martinez, PR Director for the local Boy Scouts. Boy Scouts of America (BSA)! With support from the professional and volunteer Scouting community, Civic, faith-based, and educational organizations called Charter Partners operate Scouting units to deliver the programs to their youth members, as well as the community at large. Or, contact the Alamo Area Council Main Service Center and request to talk with a Family Scouting Service Team member at 210-341-8611.